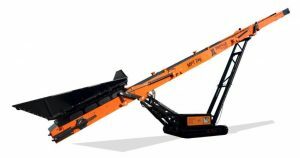 Bandit Industries will offer select trommel screens and conveyor stackers manufactured by Poland-based Pronar. Bandit said it will unveil and demonstrate the Model 60 GT-HD stacker and the Model 7.24 GT trommel at the U.S. Composting Council’s conference and trade show in Phoenix from January 28-31. “This partnership is very important for Bandit because it will broaden our product portfolio and allow us to offer a more complete line of equipment for various markets,” said Felipe Tamayo, Bandit general manager. “Pronar is one of the largest manufacturers of agricultural, compost and recycling equipment in world. The mix of products that our companies offer blend perfectly together.” Bandit and Pronar share the same level of commitment to their customers – building machines to withstand the rigors of the job and backing every single machine with the full support of the factory, Bandit said. The Model 7.24 GT is a track-mounted or towable trommel screen that has some of the highest throughput in the industry. This trommel is capable of screening a variety of materials, including compost, urban wood waste and biomass. Operators can swap out the drum screens to meet a specific size requirement. Bandit’s network of industrial equipment dealers will begin to offer these machines to their customers in 2019 and Bandit will begin to offer factory support. Pronar was founded in 1988 in northeastern Poland. Its owners founded the company focused on producing a wide range of machinery to across multiple industries. Bandit was founded in 1983 in mid-Michigan and today employs nearly 500 professionals to produce hand-fed and whole tree chippers, stump grinders, The Beast horizontal grinders, track carriers and skid-steer loader attachments. Be the first to comment on "Bandit adds Pronar trommels and stackers to lineup"